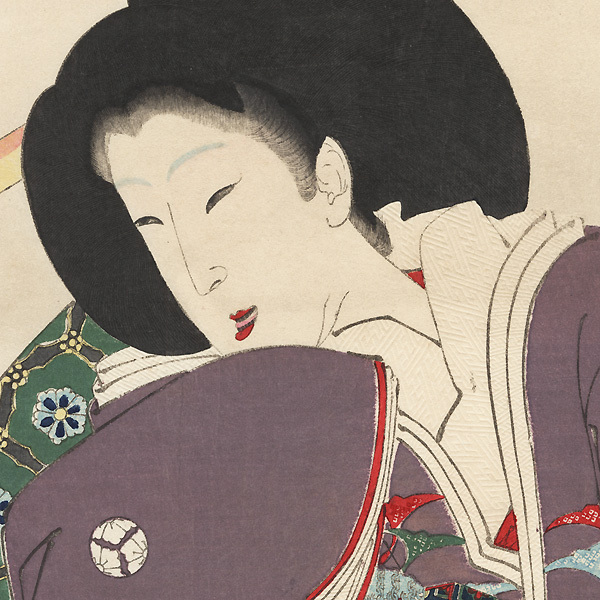 Yoshitoshi's Thirty-two Aspects of Women - Yoshitoshi's finest series of bijin-ga, or pictures of beautiful women, Thirty-two Aspects of Women features illustrations of beauties in a lighthearted reference to the thirty-two notable features of Buddha. The women depicted come from all social classes, representing beauties from the late 18th century through Yoshitoshi's own time. Each design captures a woman in a scene from daily life, realistically and sensitively portrayed as individuals rather than idealized figures. Sumptuous fabrics are beautifully rendered, and hairstyles and facial features are drawn with the most delicate of lines. 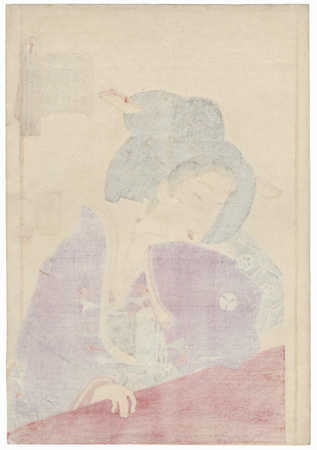 The series was beautifully printed using the most costly techniques, such as delicate bokashi shading, embossing, and burnishing, creating some of the finest prints of the Meiji era. Thirty-two Aspects proved popular with the public when first published, and has been appreciated by viewers and collectors ever since. Designs in this fantastic series are some of the most highly sought after woodblocks of the Meiji era, and are certainly considered great masterworks of Yoshitoshi's career. Amused: the appearance of a high ranking maid of the Bunsei era, No. 9 - Lovely image of a beautiful young lady serving as a lady-in-waiting in an upper class position. Of noble birth herself, she likely serves in a daimyo's mansion or the inner quarters of the shogun's palace. Being in the inner circle of the castle, she would hear much gossip, and she appears to be amused by something she has heard or seen as she looks over the edge of an expensive red lacquered railing. Her beautifully detailed hair is elegantly yet simply styled, and she wears fashionable red lipstick. The mon or crest on her sleeve belongs to her family or the family she serves. 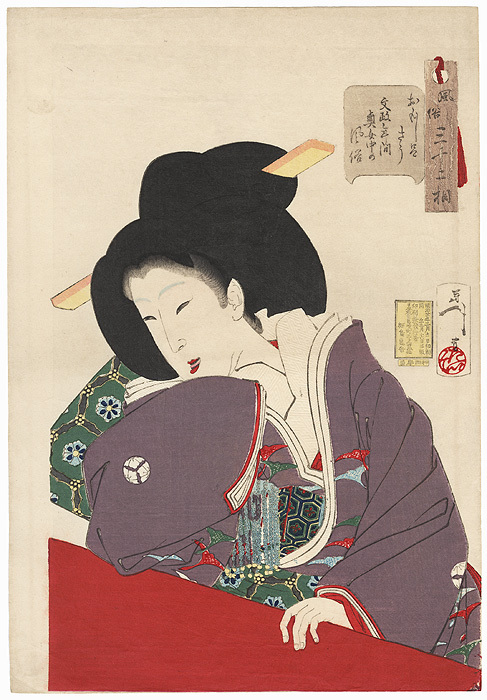 A terrific print of a confident young woman, enhanced with embossing on the white kimono collar and trim. Condition - This print with excellent color and detail as shown. A few small marks and light creases. Please see photos for details. Good overall.